A house doesn’t need to be big to be beautiful and if you ask me, I often feel that smaller houses are quite more inviting than huge houses. This home is not about luxury, it is about living well without breaking the bank. This is a home that is well built, well designed and features many elements that many of us can have in our home and I am happy to be sharing them with you here. 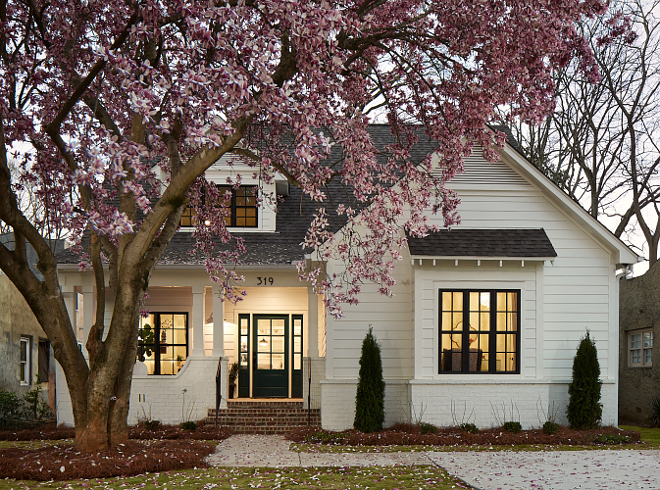 Located in Homewood, Alabama, this modern farmhouse was recently built by Willow Homes and with interiors by Willow Design Studios. 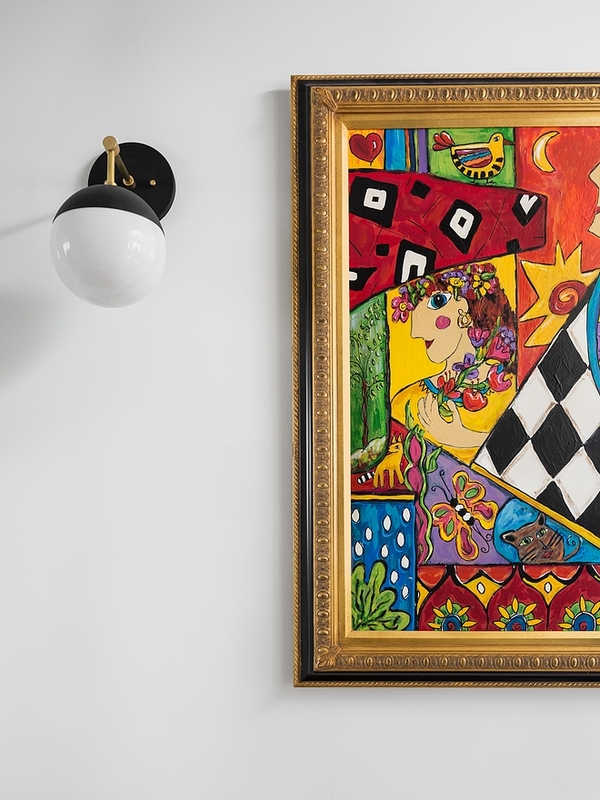 The home was a proposed project on their part and they began construction with this as a spec house, but in the design process, one of their previous client’s family fell in love with the plans and design and decided to buy it while adding their own personal flair to the home. The client loved peacock green and the designers played with several different blues and greens to find the perfect cabinet color. 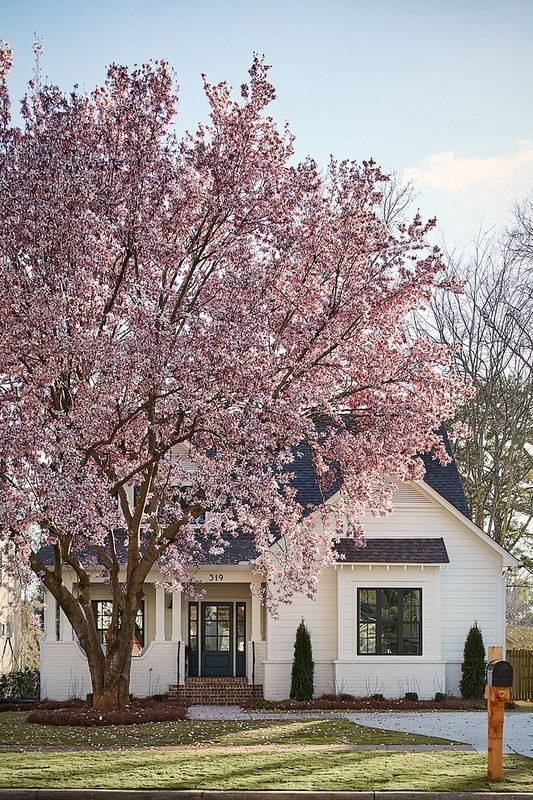 The same color was used to paint the front door, which adds the perfect pop of color to the classic white and black exterior. The transom glass from the dining area to kitchen was one of their favorite design features because it makes the house feel like it wasn’t a brand-new construction. 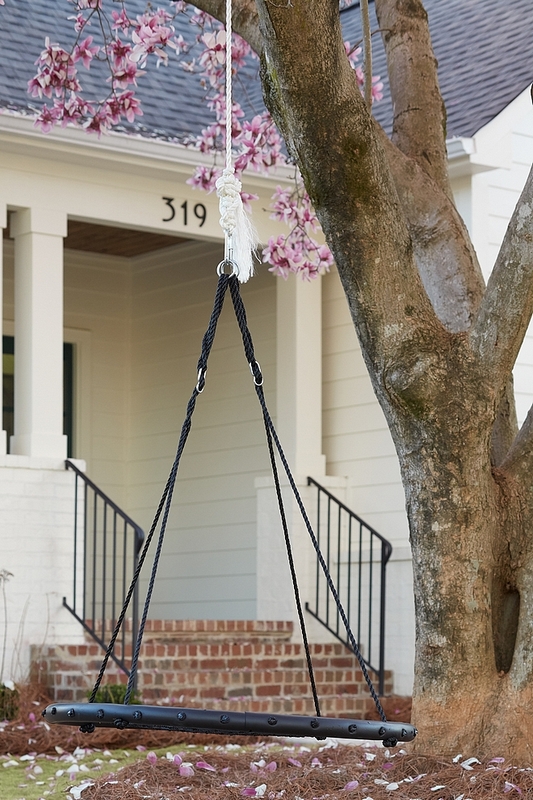 The builder also worked really hard to preserve the Japanese Tulip tree in the front yard. They were very careful during construction and actually held off to take pictures until it was in full bloom. Windows are Dark Bronze Aluminum Windows. Front Door Paint color is Yorktowne Green HC-133 by Benjamin Moore. 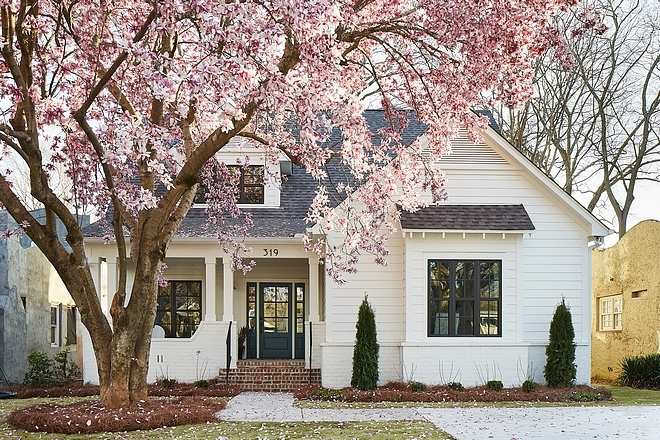 Exterior paint color is Benjamin Moore White Dove. Trim color is the same. 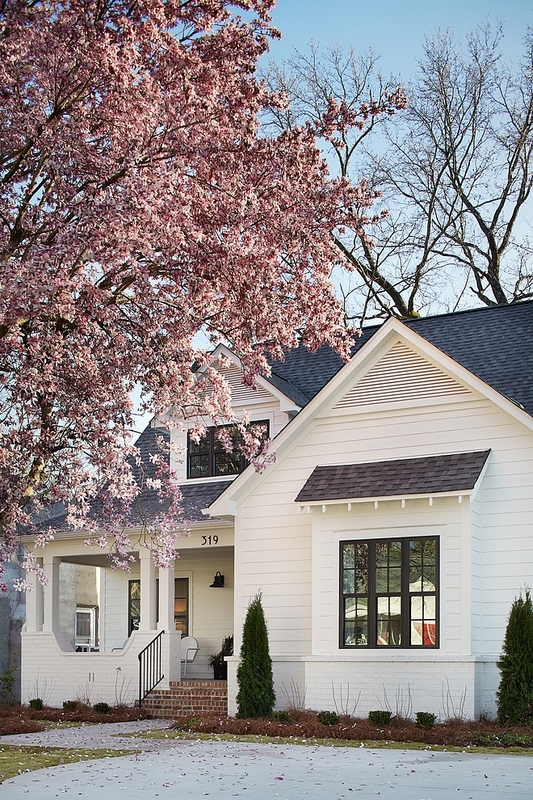 Benjamin Moore White Dove is not stark white and it looks great on exteriors. 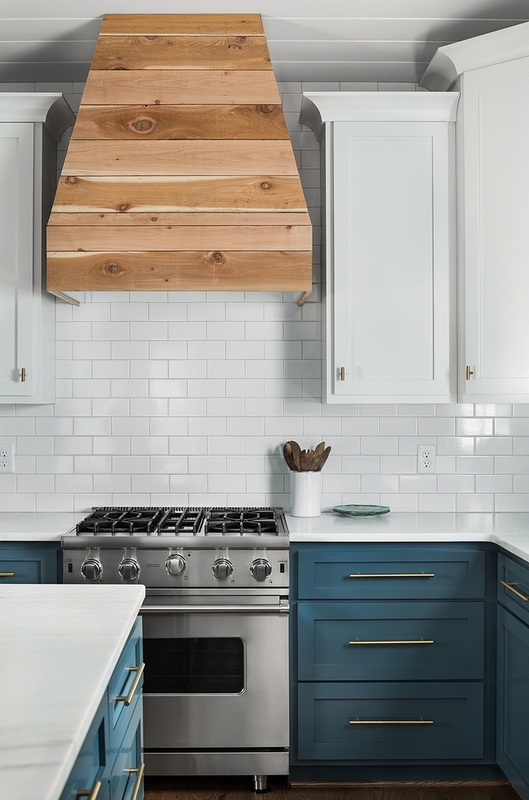 This home features an inspiring two-toned blue and white kitchen with wood accents. Shiplap Hood: Custom Rough Cedar Vent Hood. Cabinets are Poplar wood shaker style cabinets. 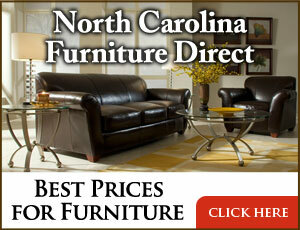 Kitchen Cabinet Hardware: Amerock Bar Pulls – Smaller Drawer Pulls – Door knobs. Similar Range: Here & Here. 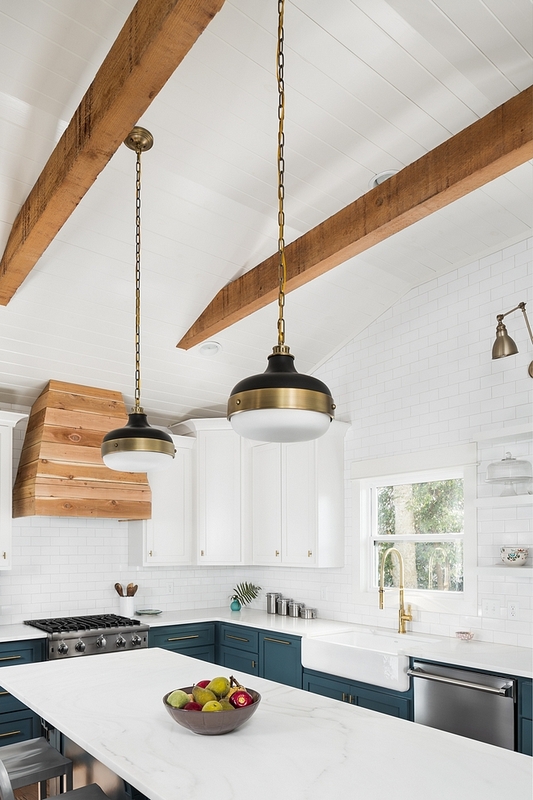 Ceiling Treatment: This farmhouse kitchen features painted shiplap and beams on a vaulted ceiling. Countertops are 3 cm honed Covelano Fantastico. 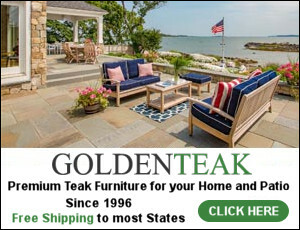 Kitchen faucet is California Faucets Corsano Culinary Pull Out Kitchen Faucet. 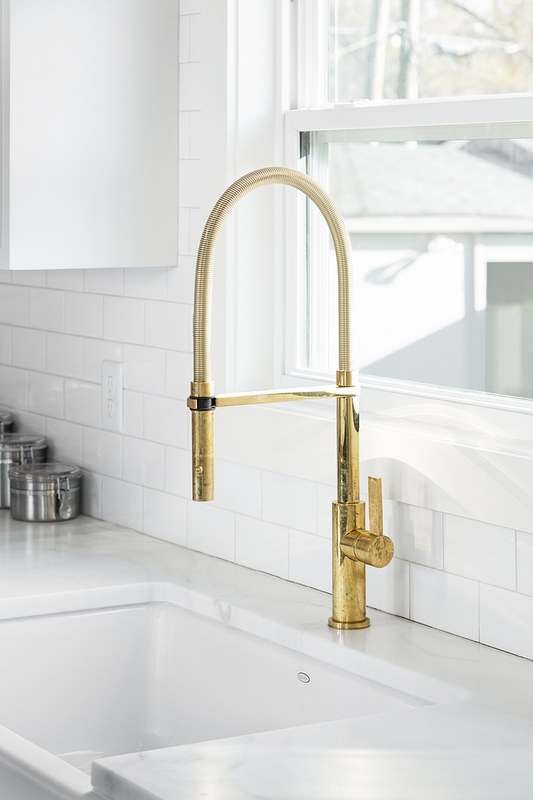 – Beautiful Kitchen Faucets: here, here, here, here, here, here, here & here. Two-toned Kitchen Paint Color: Upper Cabinets: Benjamin Moore White Dove. Lower Cabinets: Yorktowne Green by Benjamin Moore. 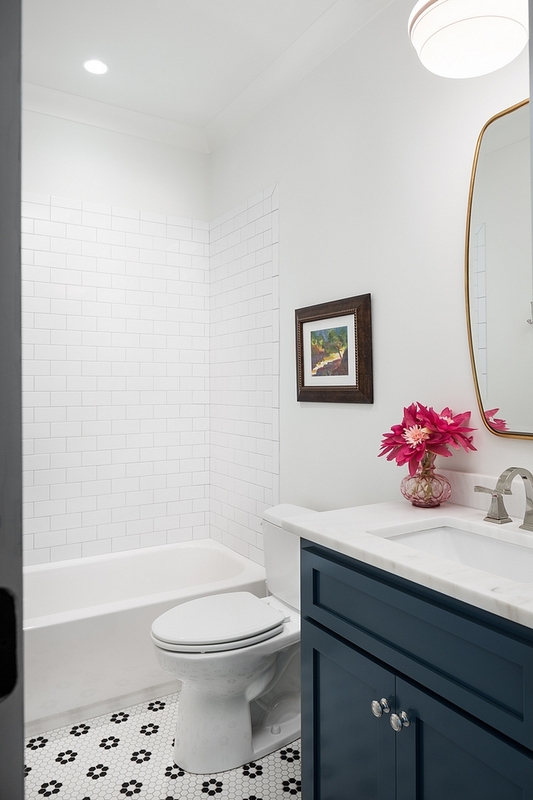 Backsplash is 3×6 white subway tile that is extended to the ceiling with white grout. 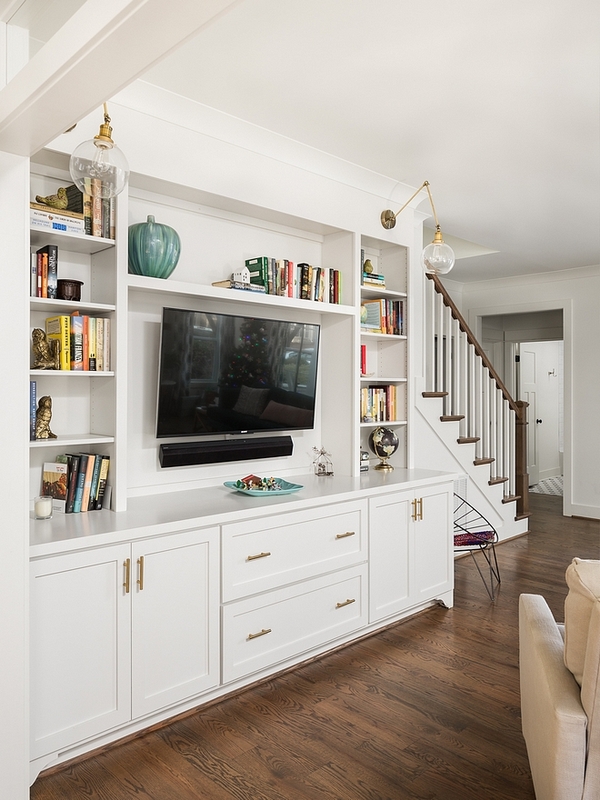 Similar White Floating Shelves: Here. Swing Arm Sconces: Savoy House – Similar: Here, Here, Here, Here & Here. 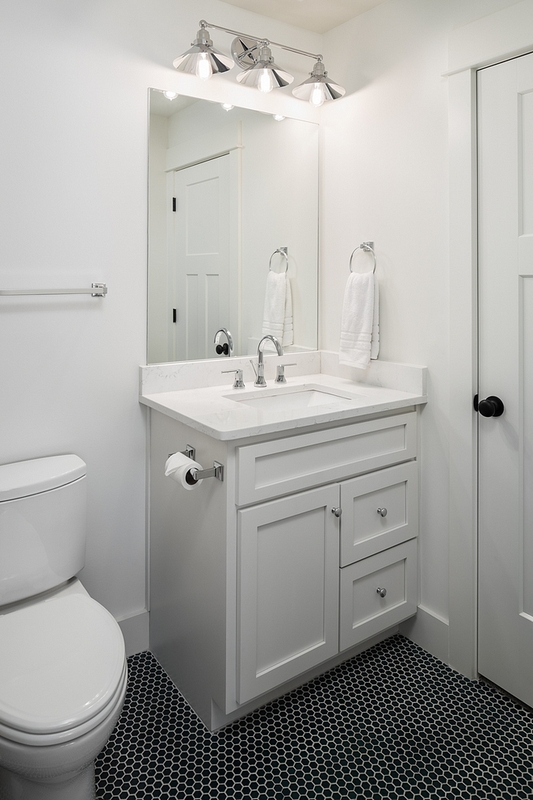 Built-in Paint Color: White Dove by Benjamin Moore. Hardwood Flooring: 5” Red Oak in Antique Brass stain. 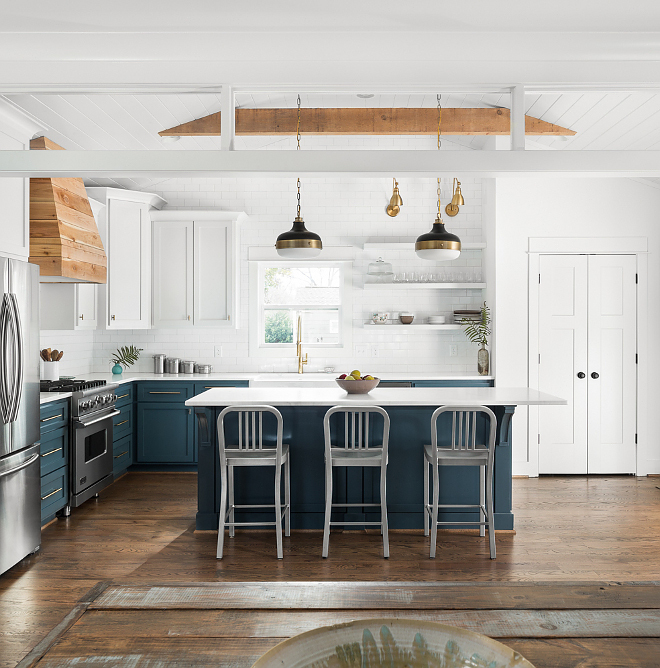 All paint on interior walls are painted in White Dove by Benjamin Moore. 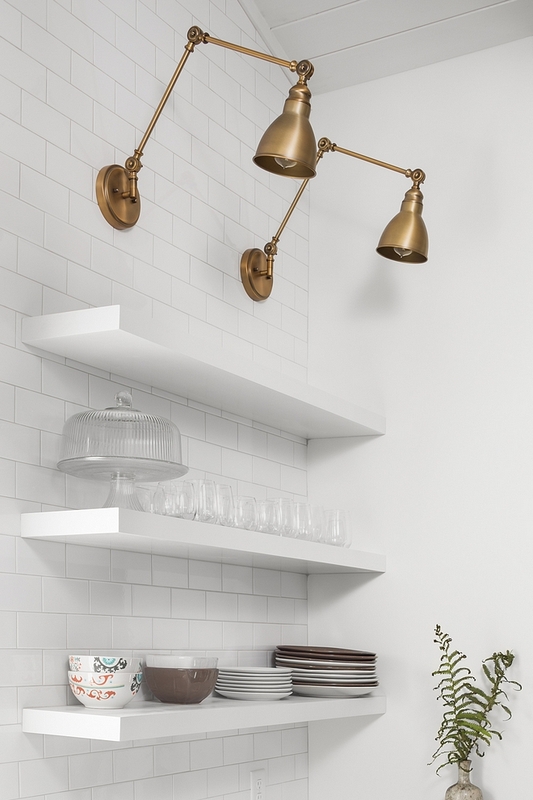 Similar Sconce: Here , Here (amazing sale!) & Here. Lighting: Here. 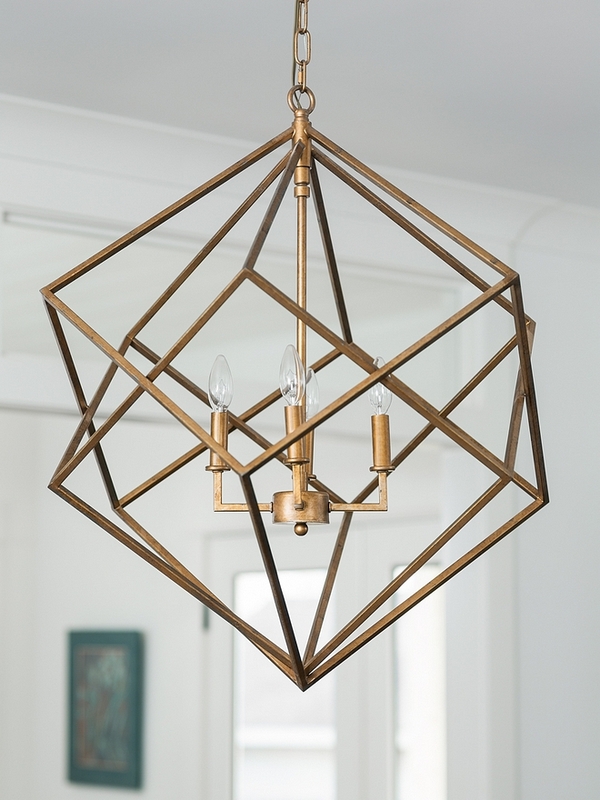 Other Inspiring Geometric Lighting (Different Sizes): Here, Here, Here, Here, Here, Here, Here, Here, Here & Here. Upstairs bathroom cabinet is painted in Benjamin Moore White Dove. Bath floor is 1×1 ceramic hexagon mosaic tile with white grout. Bathroom Lighting: Here. Similar Lighting: Here (love this!!!). All the door hardware/knobs is matte black door hardware. This nursery is painted in Benjamin Moore White Dove OC-17. Beaded Chandelier: Pottery Barn Kids – Similar: here, here, here, here & here. Cabinet Paint Color: Farrow and Ball Blue Black. Floor Tile: 1 inch Retro Matte White Black Rose Hex Mosaic Tile. 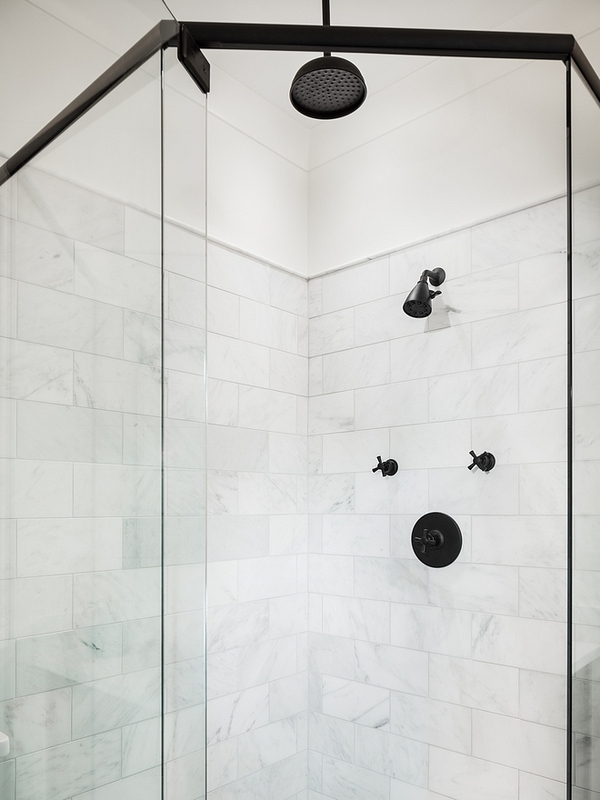 Shower Tile: White Subway Tile. 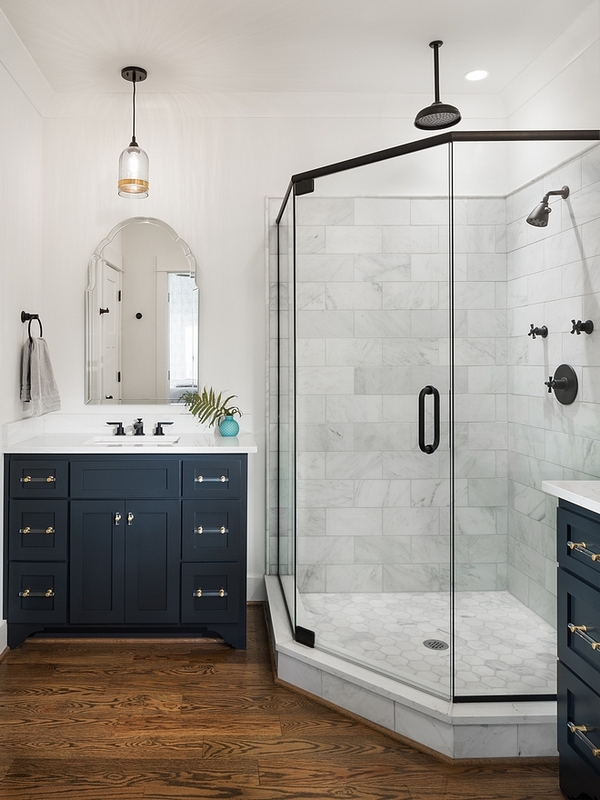 The master bathroom features some farmhouse influences. 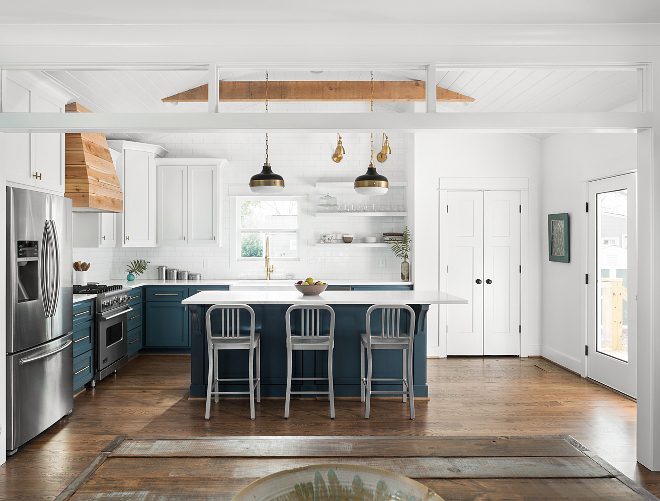 I love the blue cabinets and the warmth the hardwood flooring brings to this space. Bathroom Faucet: California Faucet – see more bathroom faucets here. 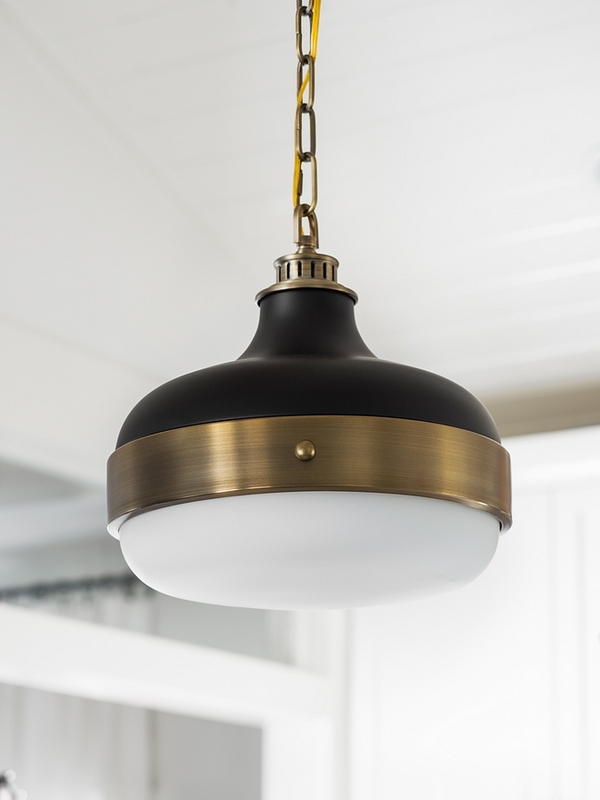 Glass Pendants: Crate and Barrel. Shower Tile: Walls are Arabescato Carrara Marble Tile. Floors are Carrara hexagon mosaic tile. 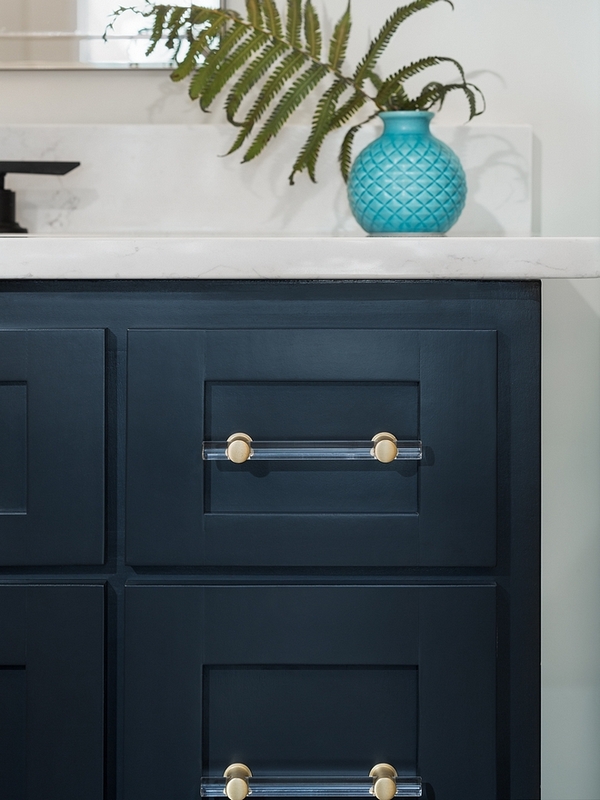 Cabinets are painted in Blue Black by Farrow & Ball. Similar Acrylic Pulls: Here & Here. 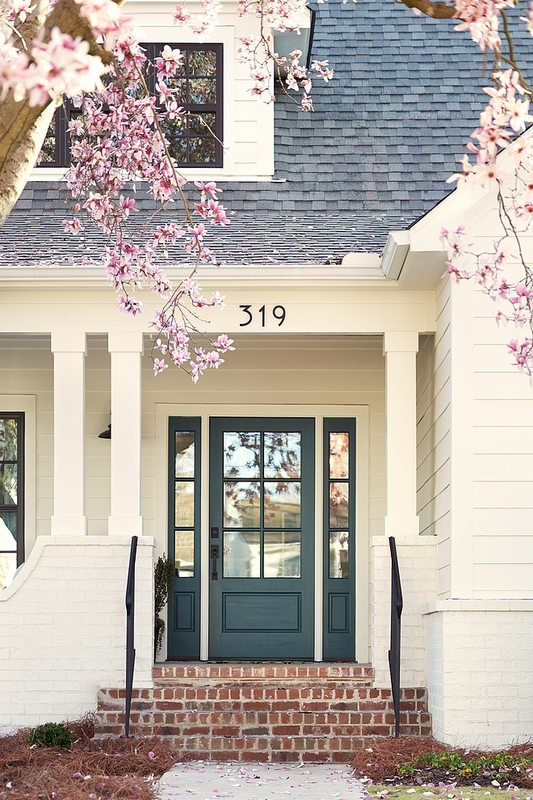 Hello, what are the exterior door and siding colors? 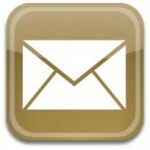 They’re specified on the blog post.